Putting free jigsaw puzzles together online can be a great way to get your puzzle fix without the mess of dealing with all those tiny pieces. In fact, you get all the enjoyment without the hassle of cleaning up afterwards. While online puzzles are usually not as elaborate as their 1000+ piece traditional counterparts, some do offer has many as 500 pieces and can be quite challenging. Like traditional jigsaw puzzles, you have the option of choosing which images you want to tackle. Animals, landscapes, people, and cars are just a few of the typical online puzzles you can try. The Jigsaw Puzzles site offers a variety of puzzles that can be made more difficult by changing the quantity of puzzle pieces (up to 500 pieces). For even more fun, users can also change the shape of puzzle pieces. Puzzles can be cut in a traditional manner, but for an interesting twist, select mosaic, square or spiral, the newest shape. Whichever method you choose, the dismantling occurs in front of your eyes, and this can be helpful when you begin reassembling the puzzle. Categories include landscape and seasonal images, castles, animals, waterfalls, and more. Since KidzPage is designed for children, all the puzzles range from six to 40 pieces and are easy to complete. With categories like cars, animals or people, to name a few, children are sure to find subject matters that interest them. If you have a child who is just learning the alphabet, be sure to check out the various puzzles for each of the 26 letters. KidzPage also offers printable coloring pages. The main downside to the site is the abundance of ads designed to capture your child's attention. Jigsaw Planet has an ample supply of images and styles for even the pickiest of puzzlers. When you land on the home page, the site will offer about five random puzzles to try, or you can select from the 20 or so puzzles featured on the page. Once you select a puzzle, you can adjust the difficulty by using the 'Play As' feature, which lets you select the number of pieces up to about 300. You can also enter a custom number of pieces if you like. A timer starts once you begin a puzzle, and you can attempt to achieve the high score. Select puzzles from categories like Most Played for the Week, Last Created, or Popular Tags. 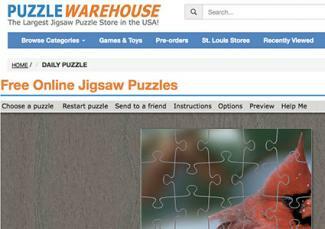 Although Puzzle Warehouse's specialty is traditional jigsaw puzzles, this site offers daily digital jigsaw puzzles. There are currently about 25-30 free online puzzles and, like many online options, the user can determine the difficulty of the puzzle. Using a sliding scale, you can change a puzzle's degree of difficulty from easy to hard. Some of the themes and images, like cartoon drawings, are especially good for younger children. The site also sells some of the digital puzzles in traditional puzzle versions. Jigzone offers a large selection of puzzles ranging from six to 247 pieces. Choose from several categories like Art, Animals, Flowers & Gardens, Nature Scenes, Ocean Life, and more. To begin, pick the image and the number of pieces you would like to build. A timer runs to show you how long it takes you to complete your puzzle. This site also includes features like a puzzle of the day, the ability to embed a puzzle on your site, or the option to upload a photo and create your own puzzle. 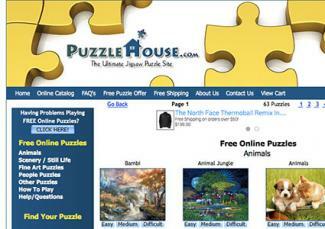 The Puzzle House offers free online jigsaw puzzles in topics like Animals, Scenery, Fine Art, People and Miscellaneous, and the degree of difficulty ranges from easy to hard. 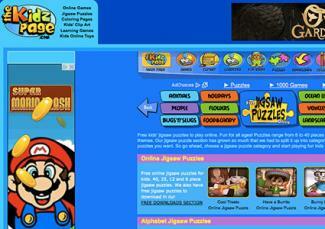 The puzzles do require Adobe Shockwave, which can be downloaded for free right at the site if you do not have it installed on your computer already. The Puzzle House is also the ultimate site for traditional puzzle lovers since their online inventory offers 500 to 6,000 piece jigsaw puzzles available for purchase. 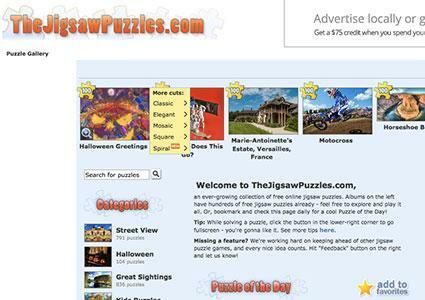 Besides featuring a daily jigsaw puzzle, Just Jigsaw Puzzles lets you create your own puzzle. You can do this by either uploading an image or by using a webcam to snap a photograph, and then using that file to create your puzzle. This site has more than 4,000 puzzles to choose from, and the categories range from typical fare like people and nature to more offbeat subjects like culture and objects or space and astronomy. You can also sign up for a newsletter and receive a link to that day's featured puzzle. One of the inherent weaknesses of online puzzle is that they tend to be easier because traditional cardboard puzzles usually contain more puzzle pieces; some have more than 2000 parts. With the current app faze, however, some phone app puzzles are pushing the envelope on complexity. One of these apps, Ravensburger Puzzle, was tested by die-hard puzzle fans before being released to the public at a price of about $3.00. With advances like this, online puzzles will truly rival their traditional counterparts one day.